Fragile X syndrome can be tricky to understand and it may not be one of the student teaching difficulties you've prepared for. But with a few changes to your typical teaching style, you can be a much more effective teacher to your student with Fragile X. And as always — especially when working with students with special needs — work hard on building a relationship with the family and working together as a team. 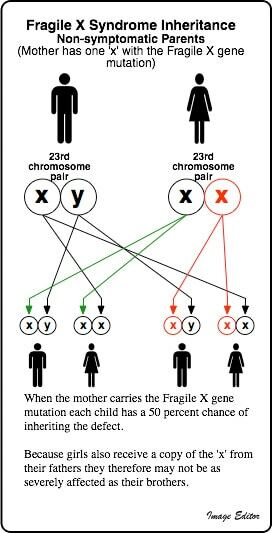 Inheritance of Fragile X. Graphic by Image Editor. There are some common behaviors seen in Fragile X, but every child is different! Students with Fragile X also have great strengths. 🙂 You might see hyperactivity, difficulty making eye contact, impulsivity, or anxiety to name a few symptoms. But you may also see a great sense of humor, eagerness to please, and interest in others. Students with Fragile X are “gestalt learners.” That means that they see the whole picture at once rather than individual steps. This is pretty different than how most neurotypical brains are wired. So if you understand things sequentially instead of simultaneously, it will take some practice to teach your student with Fragile X. Basically, instead of teaching individual steps, make sure you show your student with Fragile X what they are going to do and how they know they are finished. Avoid open-ended activities, or modify them to be something clear. For example, you could try, “write 5 sentences” instead of “free writing time.” Also avoid any teaching methods or steps that rely on sequential learning, like phonics or sounding out words. Give your student with Fragile X the whole picture. This is related to learning simultaneously and uses the student’s social strengths. When you are introducing a new activity, if possible, allow your student with Fragile X to observe another student do the activity from start to finish before it’s his turn. Students with Fragile X are prone to hyper-arousal and anxiety. This means that something that is no big deal to you or to other kids, like playfully ruffling their hair, can cause real distress to a student with Fragile X. This hyper-arousal can even lead to aggression. Try to avoid touching them unless it’s absolutely necessary, and be understanding when they appear to be anxious or overstimulated. Provide quiet times and areas that allow them to calm down. An Occupational Therapist (O.T.) can also help provide strategies for meeting your student’s sensory needs. So see if your student is already working with someone. You will need to individualize your lesson plans more for your student with Fragile X, but trust me, it’s worth it! 🙂 Enjoy your kiddo and have a great semester! Check out the National Fragile X Foundation. This is the clearinghouse for Fragile X info!